Who doesn't love Beer Pong? Well if you like Beer Pong you have to try Buzz Shot. 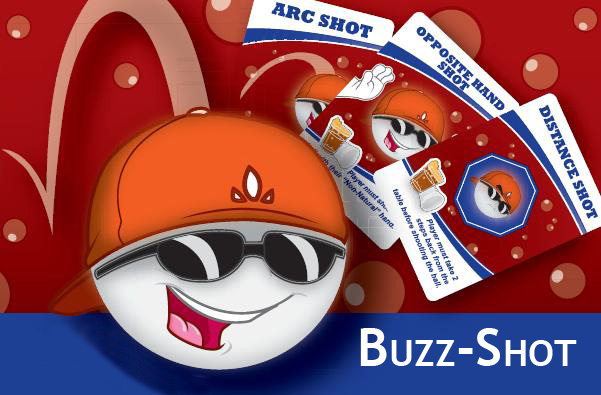 Buzz Shot a fun new drinking game that takes the best from beer pong and mixes in a card game. We have all the details for you on how to play this new game that is sweeping across college campuses. Set up the game just as if you were about to play Beer Pong. 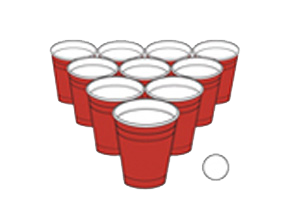 This game is played just like beer pong with two teams having two players each shooting ping pong balls into the cups arranged on the other side of the table. 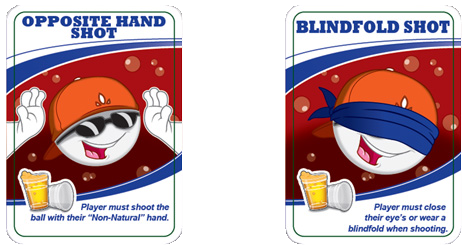 The difference is on top of all the beer pong rules you have to follow all of the different Buzz Shot card variations. The player must perform a “bounce” shot, the ball must bounce on the table before going into any cup. Any number of bounces is allowed. The player must perform an “arc” shot, the ball may not bounce on the table before going into any cup. The player must be seated when shooting the ball. The player must perform a “bounce shot” while seated rather than standing. The player must shoot the ball underhand. The ball must bounce on the table before going into any cup. The player must shoot the ball underhand. The ball must not bounce on the table before going into any cup. The player must shoot the ball with the “non-natural” hand. Right handed players must shoot with the left hand; left handed players must shoot with the right hand. The player must perform a “bounce shot” with the “non-natural” hand. The player must perform an “arc shot” with the “non-natural” hand. The player must take two steps back away from the table before shooting the ball. The player must close his eyes or wear a blindfold when shooting. The “House” writes in its own rule on this card. The player may shoot the ball in any manner he chooses. If the player makes a shot, a second cup is removed from the opponents side of the table and a cup is added to the player’s side. This “free shot” is saved and may be played at any point during the game. Another card is selected. Player must invite anyone other than an active player to shoot in his place. 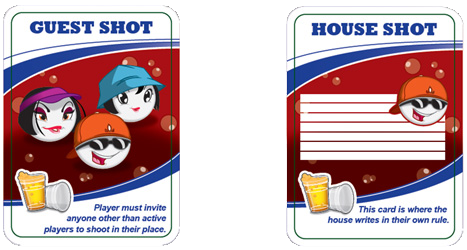 Once players agree to the “House Rules” and are set to play “BUZZ SHOT”, the cards shall be shuffled and placed in the middle of the Beer Pong table or an agreed upon designed spot. If all cards are flipped over and used before the game ends the cards are to be re-shuffled and placed back in the middle of the table so the game can continue. The “House” may also use the option of shuffling together two decks of cards before the start of the game. Before each shot, the player or team will flip over a card which will have specific instructions for the player or team to follow. The instructions are fairly simple and directions for play are spelled out on each card. The cards and instructions for play have been detailed in the section of this document listed “Card Variations”.